Most have come to appreciate Agnès Varda’s work through the feature-length narratives that, until recently, earned her the most acclaim – especially Cléo de 5 à 7 (1961) and Sans toit ni loi (Vagabond, 1985). These films have garnered multiple awards and much thoughtful attention from film scholars, and they certainly deserve such recognition for their re-envisioning of spectator identification, narrative editing and feminist narration. Yet equally important in these respects are Varda’s documentary films, which have punctuated and strongly influenced her entire œuvre. Despite their importance, however, Varda’s documentary films have received comparatively little attention in film scholarship. This article seeks to right that imbalance by bringing Varda’s documentary work into as prominent a position as her narrative films. I will focus here on Varda’s recent and highly acclaimed documentary Les Glaneurs et la glaneuse (The Gleaners and I, 2000) in light of her earlier narrative work and on its own unique terms, but I will begin by demonstrating that documentary practices have informed most of Varda’s narrative films; in retrospect, these texts point the way toward Glaneurs. 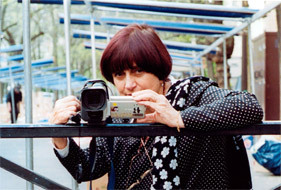 In a recent interview, for example, she stresses that: “What I’m trying to do – what I’ve been trying to do all along – is to bridge the border of these two genres, documentary and fiction.” (1) Indeed, all of Varda’s narrative films employ a documentary feel in their sense of time, their sense of historical evidence and particularly in their sense of people and place. Likewise, La Pointe-courte (1954) – Varda’s first film, often heralded as a key transitional film between Italian Neorealism and the French New Wave – evokes a documentary sense of place. The deep-focus, black-and-white long takes of La Pointe-courte capture its small seaside fishing village with striking precision. Varda also cast many local townspeople as secondary characters and extras; their daily routines, non-professional acting and friendly banter create a strong sense of documentary spontaneity. 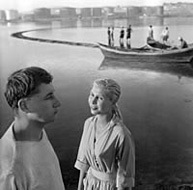 (Figure 2) These more documentary scenes contrast with narrative segments that follow a young couple’s struggling relationship; those scenes feature more formal framing, literary dialogue and theatrical blocking of the protagonists, whom Varda cast with professional actors Silvia Monfort and Philippe Noiret. 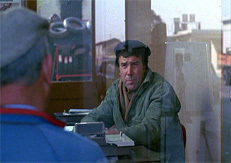 (Figure 3) This more theatrical style contrasts with the informality of the non-narrative scenes, yielding a balanced counterpoint of documentary and fiction in her very first film. A similar fusion of documentary and fiction reappears later in Sans toit ni loi, but with an even stronger presence that will bear significantly on Glaneurs. It is useful, then, to explore Sans toit’s influence on Glaneurs in some detail. Sans toit recounts the travels of Mona (Sandrine Bonnaire) (Figure 4), a young wanderer who affects the lives of those she meets before she dies alone of hypothermia. 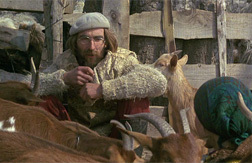 Much of the film follows Mona’s experiences on the road; since she is dead at the beginning of the film, however, her travels are told predominantly through the recollections of her acquaintances (Figures 5 and 6), both visually in flashbacks and orally in interviews with an unseen filmmaker. Like the casting of La Pointe-courte, most of these acquaintances were not professional actors but residents of the Midi region of France where Varda was filming. In fact, Varda hired only seven professional actors for a cast of more than forty in Sans toit. So, most of Mona’s encounters are with actual residents of the Midi and many of those cast are not simply extras; they have substantial screen time and interaction with Mona. Of particular importance here is Setina Arhab, a young, “new poor” traveller Varda met while filming and on whom she modelled the character of Mona. (3) Indeed, Setina appears in two brief cameos near the end of the film. In the first, she smokes marijuana with Mona and others. In the second (Figure 7), she tells an elderly, well-dressed man that “it’s easy to criticize [the poor] when you’ve got money. We’re just hanging out here. We’re fucked. We’ve got nothing.” (4) Varda underscores her project’s social critique by casting Arhab herself to speak these caustic lines. I believe that this socio-political inspiration for Sans toit stayed with Varda and found an even fuller expression, in documentary form, in Glaneurs. Made fifteen years apart, the two films are strikingly similar in their reconsideration of the new poor. As Varda puts it, her long-term project is to consider society’s “trash and waste – who finds a use for it? How? Can one live on the leftovers of others?” (7) Varda asks these questions in Glaneurs, but their thematic and formal origins clearly stem from Sans toit. Formally, both films place primary importance on the local people Varda met while shooting on location, and both are governed by one-on-one interviews with the director in which all directly or indirectly address the camera and viewer. (8) Both films follow aimless road trips through French towns and rural landscapes, and both link these episodic segments with images from the road. Both utilize a motif of tracking shots that begin and end with empty frames. And, in both films, the lone female protagonist journeys among the film’s disparate settings and peoples; in this way, especially, Mona sets a clear precedent for Varda herself as documentary-glaneuse in Glaneurs. Moreover, Varda’s brief but crucial voiceover narration in Sans toit tellingly prefigures Glaneurs. (9) After the discovery of Mona’s body at the beginning of the film, a voice-over monologue introduces the anonymous filmmaker’s project. This voice-over – in fact, Varda’s own unidentified voice – is the only time the filmmaker addresses the viewer. She explains: “The people she [Mona] had met recently remembered her. These witnesses have allowed me to tell the story of the last weeks of her last winter. She had made an impression on them.” Despite the film’s many ensuing interviews, however, Sans toit ultimately insists that the narrative question of Mona herself – her motivations, desires, and needs – must remain unanswered; in a richly feminist move, Sans toit suggests that Mona eludes any circumscribing definition or demystification seemingly promised by the film’s investigation. (10) Instead, the film’s focus shifts from Mona to her documentary “witnesses” and, to a lesser extent, to the unseen filmmaker – in one important sense, Varda herself – who gathers their stories. Alison Smith also acknowledges that Varda voices the opening monologue in Sans toit, but she minimizes the importance of this gesture and suggests that the anonymous narrator “is not Varda. At most, we may identify her as ‘the Film-maker’, a persona adopted by Varda who will not further intrude into the diegetic space.” (11) Smith proposes instead that the anonymous narrator may be one of the film’s protagonists: the academic botanist Madame Landier (Macha Méril). When read in the context of Varda’s fifty-year passion for documentary, however, her choice to speak the opening lines of Sans toit is clearly vital; Macha Méril/Madame Landier certainly could have narrated these lines, but Varda chose her own voice instead. At one level, this presence within the film acknowledges her own authorship; but, more fundamentally, it underscores Varda’s long-term commitment to the real-life “witnesses” she meets while researching and making her films. In Glaneurs, Varda once again narrates in voice-over. This time, however, she takes the further step of coming out from behind the camera to converse onscreen with her interviewees and viewers. As a result, the structures of identification in these two films differ significantly. In Sans toit, multiple factors intentionally impede viewer identification: the lack of characterization of the deceased Mona, the relentlessly grey winter landscape, the shifting points of view among the many interviewees and the unseen filmmaker. Glaneurs also presents shifting viewpoints and multiple interviewees, but Varda’s sustained personal presence (onscreen and in voice-over) centres the film and the viewer’s identification. Moreover, its fall and springtime settings are lighter in tone than the bleak winter of Sans toit, and its frequent moments of levity counterbalance its touching interviews – all strategically fostering viewer identification with the people and themes of the film. Glaneurs explores the tradition of gleaning, both the legalized practice of culling left-over food from fields after the harvest and the newer practices of urban gleaning – now salvaging food and wares from city markets and trash dumpsters. The tradition is widely known today through 19th-century paintings of peasant women gleaning, as in Jean François Millet’s “Les Glaneurs” (1857) and Jules Breton’s “La Glaneuse” (1877). Varda visits these two paintings early in the film as she introduces the concepts, rules and traditions of gleaning – and, of course, to wink at her film’s title, the most literal interpretation of which is the combination of the two paintings’ titles, “Les Glaneurs” and “La Glaneuse”. Varda then makes extended driving tours from France’s rural fields to its urban markets in order to meet and, with her handheld DV camera (Figure 8), to chronicle the lives of gleaners of all sorts along the way. Her interviews reveal that some glean out of necessity while others glean as a lifestyle choice or in rebellion against commercialism and waste. Mimicking the course of her travels, the film itself follows the circuitous path of a meandering but inspired road trip – or, as Varda describes it, a “wandering-road-documentary” (12). With footage from the road serving as a connective motif between locations, she hopscotches across France gleaning the film’s principal interviews, stories and images, but also odd details that initially seem to function as digressions. 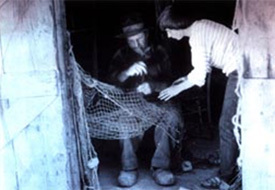 At first, these diverse people, their life conditions and their reasons for gleaning seem unrelated; but, over the course of the film, Varda draws remarkable social connections among them, encouraging viewers to connect motives one might expect for gleaning, such as poverty and adversity, to more unexpected ones, such as resourcefulness, tradition, art and activism. As its primary theme, then, Glaneurs seeks to recast both gleaning and gleaners in a sympathetic light. Varda seeks to humanize groups of gleaners and to redefine what – and most importantly who – is gleaning. Her compassion and cinematic techniques encourage viewers to listen to and join her conversation with the gleaners, rather than judge them from a safe distance. She gently encourages us to open our eyes and minds, to acknowledge and accept a class of people that society trains us to ignore. I would argue that these lighter moments of the film function to augment Varda’s political point rather than override it. By design, these moments of levity and humour work in counterpoint to the film’s more disconcerting hardships theme – much like the editing of La Pointe-courte. And, together, these shrewdly contrasted segments expand the category of gleaners beyond the need-based poor to include recreational gleaners and middle-class viewers. After all, we have all gleaned in some fashion as children, artists, recyclers, etc. Often in these personal moments, Varda wryly nods toward her art historical training, drawing parallels between herself and artists such as Rembrandt Harmenszoon van Rijn, Étienne-Jules Marey, Antoni Tàpies, Rogier van der Weyden, Cai Guo-Qiang and others. Such art references initially seem unrelated to the film’s principal theme of gleaning, but, again, she connects them in surprising ways. For example, her extreme close-ups of the figures in Van der Weyden’s “Last Judgment” (1450) parallel the suffering and joy of the myriad gleaners she interviews, as well as the judgment of society against them. In another parallel, she playfully adopts the pose of Breton’s “La Glaneuse” for the camera, balancing a bundle of wheat proudly on her shoulder before dropping it in favour of her DV camera (Figure 9). Though seemingly whimsical, it is significant that she adopts the pose of the subject of the painting here – the gleaner herself, not the artist himself. In doing so, she creates an explicit connection with her interview subjects, furthering her breakdown of the barriers between filmed subjects and filmmaker. Similar moments feature highly abstracted close-ups of the roots of her greying hair, cabbages after the harvest, mangled cars after they’ve been crushed, a lucite clock missing its hands (Figures 11 and 12). 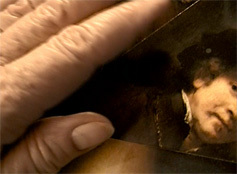 The film’s voice-over and cutting always relate these moments back to Varda’s self-portrait of her own aging process, as she dryly comments that “my hair and my hands tell me the end is near” or “a clock without hands, that suits me. You don’t see time passing.” Again, although somewhat whimsical, the ensuing pauses in her commentary and elevated minor-key music render each of these confessions disquieting; yet, ultimately, these explorations of her own ageing approach a more fascinated than fearful tone. Her close framings in loving detail almost fetishize these harbingers of death and, in an adept feminist move, revalue the physical signs of age that society chooses to malign. Melissa Anderson, interview with Agnès Varda, “The Modest Gesture of the Filmmaker”, Cinéaste, Vol. 26, No. 4, 2001, p. 27. Yvonne Baby, interview with Agnès Varda, “The Struggle between Coquettishness and Anguish”, Le Monde, 12 April 1962; reprinted in Jean Douchet, The French New Wave, translated by Robert Bonnono (Paris: Éditions Hazan-Cinémathèque Française, 1999), p. 219. In her writings about Sans toit, Varda is careful to correct any misunderstandings: Setina Arhab did not inspire the film itself, since they met during the film’s shooting. However, she did inspire Varda to change the focus of the film from three protagonists (two males and one female) to a lone, rebellious woman representative of the “nouveaux pauvres”. 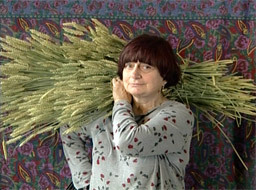 See Agnès Varda, Varda par Agnès (Paris: Cahiers du cinéma, 1994), pp. 166-8. All quotes from Sans toit ni loi are my translations from the film, and quotes from Glaneurs are my translations from the film and from the French shooting script generously provided to me by Varda’s production company, Ciné-Tamaris. Susan Hayward, “Beyond the Gaze and into Femme-Filmécriture: Agnès Varda’s Sans toit ni loi (1985)”, in Susan Hayward and Ginette Vincendeau (Eds), French Film: Texts and Contexts (London: Routledge, 2nd ed., 2000), p. 272. Varda par Agnès, p. 166, my translation. 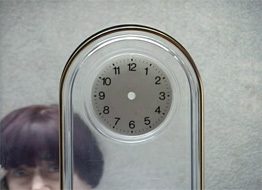 Agnès Varda, promotional materials for Les Glaneurs et la glaneuse (Paris: Ciné-Tamaris and the Groupment National des Cinémas de Recherche, 2000), p. 2. For a thorough analysis of Varda’s three modes of address in Sans toit, see Sandy Flitterman-Lewis, To Desire Differently: Feminism and the French Cinema (New York: Columbia University Press, 1996), pp. 304-5. Varda narrates several of her earlier films in an intimate, first-person voice-over – especially Daguerréotypes (1978) and her delightful short, Ulysse (1982) – similarly foreshadowing the style of Glaneurs. For detailed feminist readings of Mona’s character and narrative in light of Laura Mulvey’s work, see Flitterman-Lewis and Alison Smith. Agnès Varda, personal appearance, Paris, 23 July 2000. Richard James Havis, “Varda Gleans DV Style”, 2-pop: The Digital Filmmaker’s Resource Site, online, 30 May 2001. Virginia Bonner is Assistant Professor of Film & Media Studies at Clayton State University. Her current book manuscript focuses on intersections of documentary, avant-garde and feminist cinemas, particularly as they converge in the work of Left Bank filmmakers Chris Marker, Alain Resnais and Agnès Varda.